Briefing: Like the scrappy military transport that would become the Jeep Wrangler, the Land Rover Defender has evolved over its 65-year history, but has never jettisoned an ounce of capability. 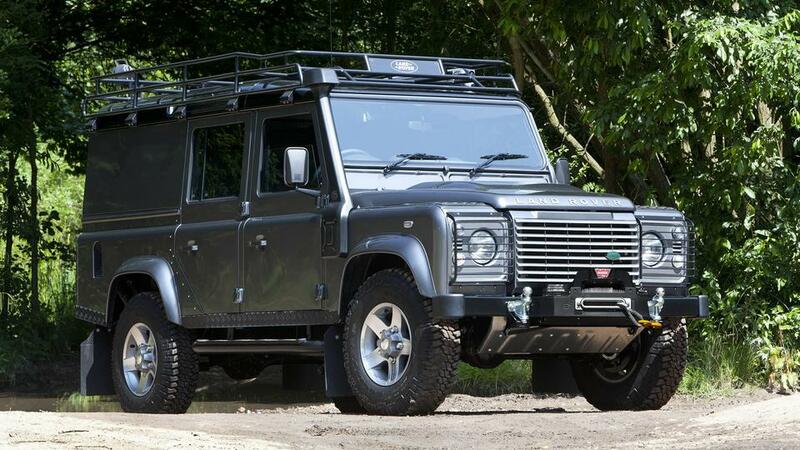 Available in hard-top, double-cab, pickup and bare-chassis configurations, the Defender is found around the globe, with some 55,000 units in active military service. 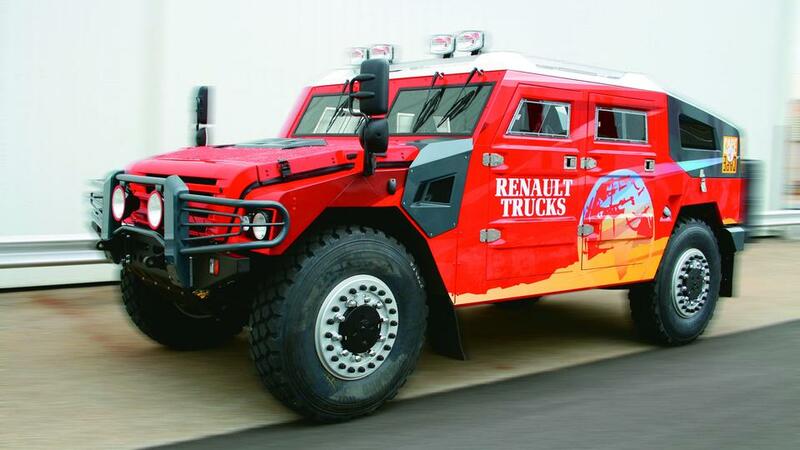 Briefing: Renault’s mighty Sherpa owes its appeal not only to the olive drab versions piloted by French and NATO soldiers, but to the charismatic appearances of the civilian model in the grueling Dakar Rally. Available by special order in Russia, Africa and the Middle East, the non-military Sherpa can be had as an unarmoured station wagon or pickup, or, for war-zone duty, a fully-armoured wagon. Power comes from a deafening 4.76-litre four-cylinder diesel engine. Its 215hp and 590lb-ft of torque reach all four wheels through a six-speed automatic transmission. Briefing: That the military Tigr bears a passing resemblance to the American Humvee is, to the Russian truck’s vociferous fans, nothing more than coincidence. Beneath its expansive hood rumbles a 5.9-litre diesel engine, which meets a six-speed manual transmission and permanent four-wheel-drive. Production of the civilian Tigr – which can soften its brutality with the addition of such creature comforts as leather, air conditioning and a thumping audio system – is hardly a top priority for GAZ, and acquiring one is neither simple nor inexpensive, but a successful buyer is fairly guaranteed to be the only Tigr-tamer in his okrestnosti. 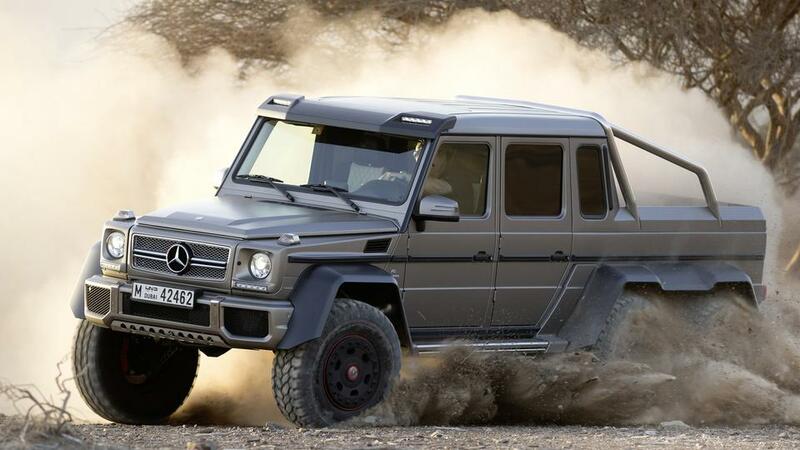 Briefing: As production vehicles go, the Mercedes-Benz Geländewagen, otherwise known as the G Class, is ancient. Merely revised during more than 30 years of production, this bricklike military machine in a civilian paintjob still manages to capture the imagination of those who dream of traffic parting with their approach – business tycoons, action-film stars, the Pope. Like the “standard” G63 AMG, the new G63 AMG 6×6 packs a twin-turbo 5.5-litre V8 engine producing 536hp and 560lb-ft of torque. The engine meets the six-by-six drivetrain from Mercedes’ hulking Zetros truck, yielding 15.75in of ground clearance – sufficient to ford water as deep as 40in. Getting behind the wheel of this ultimate G Class, unless you happen to be, say, a James Bond villain, will be tricky. The vehicle is not (legally) destined for North America or right-hand-drive countries, and Mercedes has promised that production volume will be “very small”. 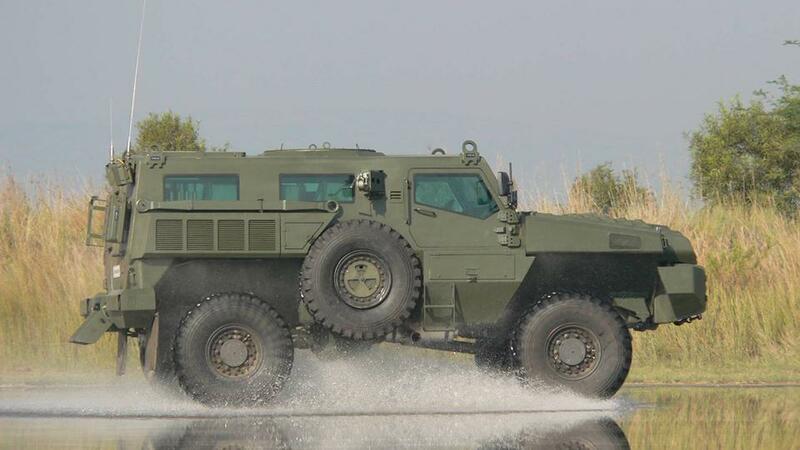 Briefing: Ten tonnes of South African stoutness, the Marauder is possessed of a double-skin monocoque that helps it resist virtually all forms of light-arms fire, as well as the occasional anti-tank mine. It also, as Top Gear’s Richard Hammond learned, is rather good as a city runabout – provided the pilot steers clear of fast-food drive-throughs. Briefing: How to replace a fleet of aging Humvees that numbers in the tens of thousands? With a bit of technological derring-do. 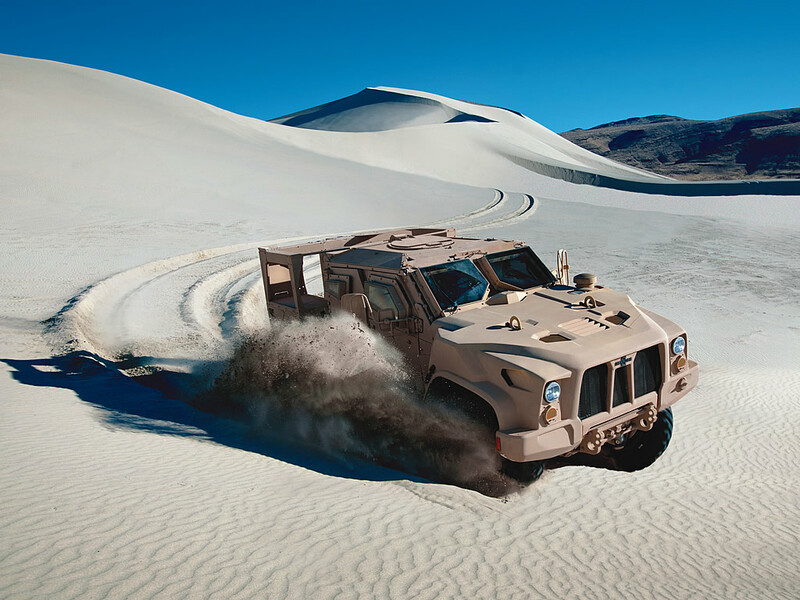 Wisconsin-based Oshkosh Defense has developed the L-ATV prototype to pick up where the Humvee has left off, carrying a diesel-electric hybrid powertrain that allows the purpose-built vehicle to run near-silent when missions require it. 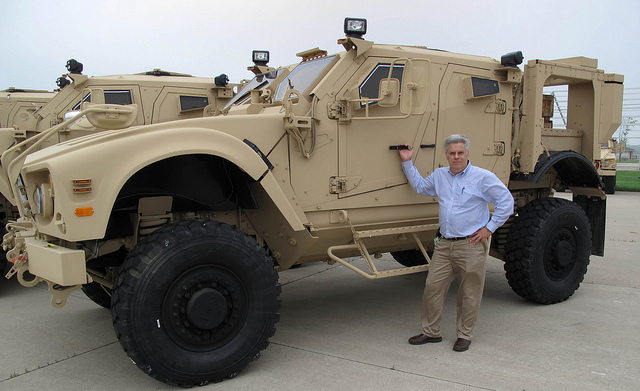 The US government has taken delivery of 22 L-ATV prototypes for testing, but civilian sales do not figure in Oshkosh’s immediate product plans.